If you can't hear your friends in an Xbox Live party or you can't join or host a multiplayer game using Xbox Live on Windows 10, follow the solutions on this page. Check your NAT type on the Network tab of the Settings screen in the Xbox app and find out how to troubleshoot it below. Click the Start icon and open the Xbox app. Under Network status, check the NAT type. With an OPEN NAT type, you're able to play and host multiplayer games with people who have any NAT type on their network. With a MODERATE NAT type, you're able to play multiplayer games with some people; however, you might not be able to play with others, and normally you won't be chosen as the host of a match. With a STRICT NAT type, you're only able to play multiplayer games with people who have an OPEN NAT type. You can't be chosen as the host of a match. Your NAT type can be in one of four states. Based on the one you see, click the appropriate link below for troubleshooting steps to help resolve your issue. Open With an Open NAT type, the issue is probably not related to your home network. You should be able to play and host multiplayer games with people who have any NAT type on their network. If your issue is tied to not being able to hear or be heard by others in an Xbox Live party chat, check to confirm that all your audio hardware (headset, mic, speakers) is working. For Xbox headset troubleshooting, see Accessories: Headsets. Moderate or Strict If your NAT type is either Moderate or Strict, you may want to try either setting up a perimeter network (also known as DMZ) or port forwarding. You can only use one of these options at a time. The instructions to set up each are listed below. Teredo is unable to qualify If your NAT type is showing Teredo is unable to qualify, see Xbox app NAT type on Windows 10 displays “Teredo is unable to qualify” to troubleshoot. Perimeter network (also known as DMZ) functionality on a router is used to remove restrictions to the Internet. This essentially moves your device to an area outside your network firewall. You should be able to connect to Xbox Live, join games, and host games or parties if you enable perimeter network functionality on your router. Note It's critical that you use a static IP address on the PC when you set up a perimeter network. To set a static IP address, use your router's DHCP reservation function, when available. If this isn't available, you'll have to set up manual IP settings on your PC first. You'll only be able to place one PC on the perimeter network. If you have multiple PCs, this solution will only resolve the issue for one. Important Don’t use a combination of port forwarding, UPnP, and perimeter network settings. If this solution doesn’t resolve your issue, you must disable the perimeter network (DMZ) before you go to the next step. For information about how to enable and disable the perimeter network setting on your router, visit our Networking Hardware Information forums (this information can be found under the heading "DMZ" for your router). If we don't have content for your specific router, consult your router documentation. The instructions will reference an Xbox console, but they can be used in a similar way for your PC. Note Clicking this link opens a second browser window so that you won't lose your place while looking for information about how to configure your network hardware. Important Microsoft disclaims any and all liability arising out of your use of the third-party companies, software, solutions, services, and training listed on the site. All software, solutions, services, and training are provided "as is" and without warranty unless provided by the authoring third-party company. Under Network status, select Check again. If your NAT type shows Open, this is your best state and your issue should be resolved. 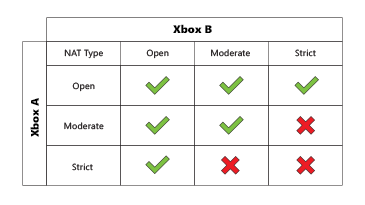 If your NAT type shows Moderate, this is a good state, but you may still have issues communicating or playing with other people who have Moderate or Strict. If your NAT type shows Strict, this state will have the most issues communicating or playing with others. If you’re still experiencing issues, you can try the port forwarding solution. Make sure you restore your PC to the previous settings first. See Open network ports using port forwarding to find out how to do this. If you're connected to a home network, you may need to open ports on your network hardware yourself through port forwarding. To set a static IP address, use your router's DHCP reservation function, when available. If this isn't available, you'll have to set up manual IP settings on your PC. To reserve a static IP address for your PC within your networking hardware, go to the DHCP or LAN section of your router’s UI and add the MAC address of the PC in the reserved section. We've gathered information about how to enable DHCP for several models of routers and gateways. For more information, visit our Networking Hardware Information forums to learn how to configure and update your specific network hardware. Note Using the link above will open a second browser window so that you won't lose your place while looking for details on how to configure your network hardware. If the DHCP reservation function isn’t available on your router, you'll have to set up manual IP settings on your Xbox. Click the Start icon, type cmd, and then press Enter. At the prompt, type ipconfig /all, and then press Enter. Make up a unique IP address for your PC, and write it down. A simple way to do this is to increase the last number of your computer's IP address by 10. For example, if your computer's address is 192.168.1.2, use 192.168.1.12 for your PC's unique IP address. Note Each IP address on your network must be unique. Now you need to set your PC's IP settings. Click the Start icon and open Settings. Right-click the network connection you want to configure, and then select Properties. Select Internet Protocol Version 4 (TCP/IPv4), and then select Properties. The Internet Protocol Version 4 (TCP/IPv4) Properties dialog box opens. On the General tab, select Use the following IP address. In IP address, type the IP address that you created. Press TAB to place the cursor in Subnet mask. A default value for subnet mask is entered automatically. Either accept the default subnet mask, or type the subnet mask you want to use. In Default gateway, type the IP address of your default gateway. In Preferred DNS server, type the IP address of your DNS server. If you plan to use the local PC as the preferred DNS server, type the IP address of the local PC. In Alternate DNS Server, type the IP address of your alternate DNS server, if any. If you plan to use the local PC as an alternate DNS server, type the IP address of the local PC. Select OK, and then select Close. We've collected additional information about how to enable port forwarding for several models of routers and gateways. Visit our Networking Hardware Information forums to learn how to configure and update your specific network hardware. If your manufacturer isn't listed here, refer to your documentation or your hardware manufacturer's website for help finding the default IP address. Type your username and password (for your router or gateway), and then select OK. Note If you don't know your default username and password, refer to your hardware manufacturer's documentation. After you're logged in, you should see your router or gateway's configuration page. Important Do not use a combination of port forwarding, UPnP, and perimeter network (also known as DMZ) settings. If you previously enabled perimeter network functionality on your router, you must disable the perimeter network before you try this procedure. If you’re still experiencing issues, you can try the enable perimeter network (also known as DMZ) solution. Make sure you restore your PC to the previous settings first. See Enable perimeter network (also known as DMZ) functionality on your router to find out how to do this. If you're unable to resolve the issue, leave us feedback using the Still having problems? Send us some feedback link under Networking in the Xbox app. Would you like to contact Support regarding the "Troubleshoot audio in parties and issues with multiplayer games on Windows 10" issue you were reading about or a different issue?